naturally has increased as well. My current main project(s) are most likely to see daylight at Assembly 2004, 2005 or even as late as 2006. I was, however, able to find enough time this year for one contribution. More of that later on. It was time to leave towards the party arena, more precisely to the oldskool area where I had obtained my "VIP" ticket this year aswell. 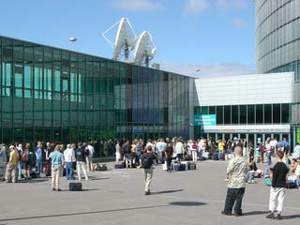 The four-day-event started at the Hartwall arena, in Helsinki city (Finland), on Thursday August 7th, and lasted until the weekend closed on Sunday the 10th. This article views the event and competitions from my perspective and of those areas that I'm most interested in. I had brought my own digital camera, Sony Mavica CD500, with me to the event. Both the photo and videoclip amounts I took were huge, totaling to over 1GB of data. Like in every year before, the event had grown a bit from the previous year. This meant more party visitors, more new ideas and more scheduled events aimed to please every party visitor. The growth and changes in the event and what it holds in have been slow and steady each year, which in my opinion is only a good thing. The event's future financially and in all other ways appears to be on a rock solid basis and guaranteed for years ahead with the current table of contents. There is no need for radical changes besides every die-hard scener's wish to exclude gamers from the event competely, but as for now Assembly offered something for everyone. Assembly'03 was visited by over 5000 party visitors, which doubtly includes single day participants, so the total number goes probably well over 6000 or even 7000. The amount of visitors each year has grown so that an alltime record has been broken each year. It's safe to say that Assembly is the biggest demo-scene event of the Nordic countries and perhaps even the world, and it was here for the 12th time. The number of competitions hadn't changed noticeably from last year, but as always there were changes within the existing competitions. Few competitions, such as browser demo (former flash compo) and freestyle graphics (former raytrace compo) had been altered so that they could be approached with more creativeness than before. Especially the freestyle graphics compo should fascinate more participants to enter their work than what it did as solely a raytrace compo, although those good at raytracing probably felt a bit left aside this year. I'll definetly attend the freestyle graphics compo from next year onwards, as long as the competition gives room to the use of photographic ideas, skills and realization. This method was already seen in the works of many competition finalists this year. There was also a number of unofficial competitions, such as a tiny music competition. Music competitions had gone under very little changes, only minor tweaks here and there. The instrumental, oldskool, vocal and fast music competitions gathered a reasonable amount of entries this year aswell, although I was sensing a diminishing factor in both the amount and quality of entries contributed this year in each of the compos. The two main music competitions, vocal and instrumental, gathered around 200 entries altogether. I participated in both the vocal and instrumental music juries, for the 4th time since Asm2k. The number of music competition entries in general has gone down every year, but it hasn't reached a "panic button" -stage yet, atleast amount-wise. My only contribution for the competitions this year was a song called "Residue of Desire" which featured a very talented finnish guitar player Timo Toivonen. Luckily we had started co-working on the tune early on, and were able to evolve the song through many versions and sketches. For once I didn't have too many fishes to fry and distractions at the same time. This song was also the very first co-operative tune I had ever released, and it's already safe to say that it won't be the last. Ideas for new songs and themes carrying out unique sounds and styles had already began to form right after the Assembly. The instrumental music competition was won by !Cube with an orchestral song called "Acula class". Quasian also now re-emerged after many years of silence to the top 3 by placing 2nd with a song called "Mist of deceit". Firestorm of Doomsday wasn't as successful with his this year's music entries, and placed "only" at 4th position with a song called "Betrayal". However I'd expect he'll be making a return to the top in the following years as he told me his time to prepare this year's entries was very limited. My song called "Residue of Desire" finished 8th, which is a decent result as I've never been victorious in pure music competitions in the past either. If there was one uniting factor seen in the competition, it would have to be the amount of movie soundtrack type of approaches in the final's 15 songs. I would have enjoyed to hear more songs in "traditional styles", as this type of orchestral songs in my opinion require strong visual "stimulation" to reach their fullest strength and intensity. However the efforts seemed to pay off as many of these orchestral songs did well in the competition. The overall quality in the competition was quite good, but perhaps not as high as I would have thought. The vocal music competition was a bit more even as the point margins between the finalists weren't as large as in the instrumental music compo. Ten songs were selected for the final instead of the usual fifteen (see the "music jury process" part of my report to learn why). The competition's victory went to Aisth with a song called "Pearls", which was no suprise. 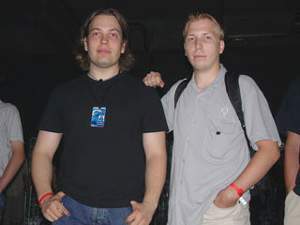 The mastermind behind Aisth is better known as "Jugi" in the demoscene. Firestorm's song "The Way of Peril" was to be found on the 8th place, which is quite a drop compared to his last year's achievements. The competition's overall quality was modest, and my guess is that if the quality nor the amount of entries won't increase in the following years, the future of the whole competition could be in jeopardy. Atleast the competition and rules might get reorganized. However on the positive side I must say that there was a delighting amount of more rock-ish songs with quality and effort than before. In my opinion the diversity of music styles in such competitions is only a positive thing. The fast music competition presented 10 songs, out of which Ari "artz" Pulkkinen's song called "Back to Roots" won the game with a clear point margin. The author of the winning song has a history of victories in this particular competition. I actually visited Ari Pulkkinen's home studio on thursday, as his was working on his vocal music competition entry. The overall quality of the fast music competition has stayed somewhat on the same level from the beginning of the competition's history. The one and a half hour timelimit the competitors have can't understandably permit complex symphonies being made, but there's always been a clear favourite of the audience which has also won. The rules of the competition however could be tightened a bit, since it's rather easy to go around them. The sample set is released right before the competition's time starts, but it has always combined pretty much out of the same elements (few drum samples, few basses, etc). There's nothing stopping people from using pre-created melodies and patterns, and infact a whole song can be done by just assigning the given samples to their predicted places in a pre-arranged song made prior to the event. The fast music competition has never had many of entries, so if you're seeking the best way to get your work heard and winning chances maximized, this is the compo you should participate in. The oldskool music competition has been dominated for a years by Britelite, but this was about to change. This year's victory went to Reed of Fairlight with a very clear margin to the second. Britelite's song "Popstar" gained the 4th position. One long era of Britelite's success in this competition now came to a small pause, but I'd bet he's already planning a new one to begin from next year onwards. The competition's overall quality was pretty good, no significant decrease of that was to be seen. I thought of letting you all have a sneak view to the jury process which usually takes place on the previous night before each competition. It was the 4th time I was taking part of the music juries at Assembly, and like always, it ment long exhausting nights for the jury members. The number of entries for music competitions have significantly been dropping every year, but it's still a long procedure to hear them all out. The vocal and instrumental music juries now had a new organizer as Veli-Pekka "Howler" Kivim�ki had given up the crown to Mikko "Yolk & Crankshaft" Karvonen. This year's vocal and instrumental music juries consisted out of 7 and 8 members, each given a blank form with numbers which represented the songs that were soon to be heard. Every song entered to the competition is rated by each of the jury members individually with a number ranging from one to five. Each song is played for an undefined time, usually rewinded at some point due the large amount of songs. This procedure allows the jury members to get an idea of the whole song and it's quality. After the jury has listened and given points to all the songs, it's time for the organizers to count down the points and name the fifteen (or less) finalists. The amount of finalists for each competition usually gets a "recommendation" from the jury members, there's a space in each of the jury forms for this. In case the overall quality of the entries is regarded as low, the competition might only have ten (or less) finalists. This year it happened for both vocal music competition aswell for the fast music compo. If a jury member has a work of his own entered to the competition he's jurying, he will leave a blank space to the paragraph where that spesific work of his own is rated. This procedure won't lessen nor raise the points for such an entry, as the final results of the jury are based on average values counted for each entry. I bet many people wonder what kind of audio playback equiptment is used in the music jury process. This year it was a JVC "boom box" hooked up to a PC. It provided enough of decent quality for the review process. The situation with audio playback gear hasn't been even this good in earlier years. The quality issue is obviously the same for every contestant, and on the other hand it doesn't really matter that much since all audio at the Hartwall arena is mono (!) and quite poor quality to say the least. So as a little hint to all of you planning on entering music in any competition, test that your music sounds good in mono and avoid the use of very low frequencies! The overall amount of vocal music entries had dropped from last year and was down to sixty. A few of the submitted songs had no vocals, which is fine if you interpret the competition rules as they are, but it leads to a situation where every jury member has to take in notice the difference of the song compared to the ones which follow the competition's full idea in having vocals. I would definetly shape the rules for the upcoming years to a form where they would say that tunes must contain human vocals instead of they may contain, as they are now saying. This would resolve many problems faced each year again and again. There is no pay or salary given for being a jury member, but many rewarding things nevertheless. Having the chance to really influence and to be able to meet all these great people sharing the same intellectual interest in music is one thing, and another one is that you get to hear (and/or see) all the competition entries before anyone else. A nice recent addition is also the free coke and chips you are treated with. This year's music jury's perhaps most well-known member was the main organizer himself, Mikko "Yolk & Crankshaft" Karvonen. The former flash competition, now known as the browser demo compo, presented a supply of versatile productions. Flash was still the most popular format seen with'in the entries. "Super fantastic gaydisco all night long" by Damones & RNO won the well-matched competition. RNO had won the competition last year aswell. Unfortunately this year's Assembly followed the "tradition" of disqualifies seen at Assembly'2002. Browser demo compo also had one in the form of "Superpowergirl" by Kone Creations which originally landed on the 2nd second place, but was disqualified a month after the party due to copyright issues and violating of the compo rules. This ment that "Linear Motion 2" by kellari received the official 2nd place, and my friend Esko Ahonen with his new fancy alias name "natural born chillaZ" landed on the 3rd place with his entry "w0rd!". By luckily achieving the 3rd place he also renewed our last year's position in the same competition. We came 3rd at Assembly'2003 with "Evolve" that featured a special version of my song called "Serenity of Silence". The competition had 11 finalists this year, which is exactly the same as the year before. I wonder if it's a signal of widely ranging quality in the competition entries. The animation competition had only eight submitted entries in total, and five of them were presented in the final. The amount of animations was smaller than in years, but the quality of those presented was still very good. Dice Production's "Kalja on loppu" took the righteous victory in the competition, followed by "Sword of 'Nur" by Toni Hollming as a very good runner-up. The animation work in "Sword of 'Nur" was very good, but suffered from a very dark overall tone of the colours. The Wild demo competition had 14 finalists with a reasonable amount of different ideas and approaches. "Grand Theft" by Otherside won the competition with almost a 4000 point margin. The amount of work that productions such as "Grand Theft" were put in is admirable. Many details are clearly thought out well before shooting and editing them together, and this applies to many entries besides just the winner. From other entries I'd mention "Newborn" by Fragile, which followed the music video format the group had presented at Asm'02 with a production which imitated the Prodigy's music video styles. Their this year's video was more on the soft side, closer to something what Enya's music would look like. However it didn't reach any higher position than 6th in the competition. The music in Fragile's video was a bit tame, and perhaps with a bit more aggressive and aspiring approach the production could've landed in the competition's top 3. The yearly grande finale of all demoscene parties was here, aswell the generous 5000 euros in cold hard cash for the winner. Unfortunately not even this competition was saved from disqualifications. "I feel like a computer" by Melon dezign came originally 3rd, but was later on discarded from the winner's rostrum. "Legomania" by Doomsday took a clear victory in the competition with a lego theme, which turned out quite popular in this year's combined demo compo. Moppi Productions renewed their last year's 2nd place with "IX" and Complex's X-Box demo called "Doomsday" landed on the 3rd position in the final results. The overall quality of the demo competition might have been a little lower than on the previous years, but not noticeable. One of the most recent major additions to the Assembly event, the seminars, were here again. This year they presented over 15 speakers ranging from the gaming industry pioneers to well-known demoscene legends. I had signed in for two seminars, but I was unfortunately unable to attend them due to rush of other things and events. Hopefully all the seminar presentations can be found on the Assembly'2003 DVD-ROM release. The concert that was held for the 2nd time in the event's history, this time nominally "outdoors" as the stage was near the party hall's loading entrance. Friday's concert featured Axes Denied, Stereo Gentleman, CNCD Outside and perhaps the most expected performer of them all, Purple Motion (a.k.a. Jonne Valtonen). Stereo Gentleman's performance was hosted with a group of "High Heels" women dancers, but was apparently the least liked performance as stories tell that most of the audience left in the middle of the show. The best of the best was rightfully Purple Motion's performance, of which I have videoclips aswell photographs provided in this party report. Purple Motion played a number of re-arranged classics aswell new songs from his upcoming CD album (more info on that coming later in this report). I wasn't able to watch the show's ending and the last performer, Stereo Gentleman, as the vocal music competition's jury duties obliged me to leave. During Stereo Gentleman's performance a living finnish legend, former Formula One driver Mika H�kkinen, was seen at the concert area with his wife. Afterwards I was being told that Stereo Gentleman's manager had some ties and links to Mika H�kkinen, and that was the reason of his appearance at Assembly'2003. Mika H�kkinen also visited the party hall's ground floor and the VIP sauna which the organizers also were using. I also heard that AssemblyTV tried to get Mika H�kkinen for an interview on television, but thye weren't able to do so. The only negative aspect of the concert was the loading entrance area's horrible acoustics, or should I rephrase and say the lack of them. The concert's too high volume levels aggravated the problem even more into a point where most of the "sound" was just pure low noise which acted as a pacemaker. One minor dowside to all television and online broadcast viewers was that AssemblyTV unplugged the show as Purple Motion came to perform. This was done because there was a possibility of music license fees they would have been issued upon as Purple Motion is nowdays a member of Teosto, a finnish composers' copyright society. I was able to talk with Purple Motion after and before his performance, and even though he admitted being quite nervous before the concert, his on stage charisma clearly won every listener's heart. Jonne "Purple Motion" Valtonen also let me in the details of his upcoming CD album, which he expects to get finished for early 2004. With permission from him I can reveal that the album will include "Starshine", "2nd Reality" and "Satellite one" out of his old classics, as the rest of the songs will be completely new, but made in the spirit of his old work. The rave parties took place at the seminar hall just like at Assembly'2002, but this year they carried an offial name of "Tekkkno party", which indeed they was. The parties took place on two nights, thursday and saturday, and lasted much longer than before. Saturday's schedule held over 7 hours of DJ performances, which undoubtedly satisfied even the most tireless dancers. The amount of prizes in total was announced to be over 35 000 euros, which is 5000 euros less than reported in last year's event. However the total value of prizes this year didn't include software prizes, so presumably the value of given prizes had grown from last year. The organizer's last year's decision to divide the prize ceremonies in two had received positive feedback, or atleast it seemed that way as the change has come to stay. One other improvement was that the organizers telephoned in advance to the prize ceremonies to those who were going to be rewarded, and by that slightly shortening the time it took for each contestant to come to the stage. One slightly more dramatic episode was seen in the second ceremony on sunday as the sovereign winner of the oldskool graphics competition was disqualified just seconds before announcement. The variety and supply of different competitions evolved again to more interesting. The organizers worked tough and well through out the event. In overall the live concert was better than last year, eventhough the concert area's acoustics were terrible. A positive change in the amount of servers and media streams transmitting the event through AssemblyTV's website. The very popular "Robo war" competition gave a nice little edge to the range of individual events Assembly featured this year. The party poster was free of charge this year. Assembly has attracted more and more women every year to take part in the event, and the year 2003 offered no exception to that. The most advanced piece of work this year would have to be the winner of the combined 64k intro competition, "Zoom3" by AND & Cybermag. Some decrease in the number and quality of the competition entries could be detected. Also the amount of original and unique ideas in many competitions could be larger. Some competition rules and founding ideas should perhaps be better defined in order to avoid unintended mix-ups (e.g. vocal music compo) and some bending and use of loopholes in the rules (e.g. fast music compo). Too many competitions have been afflicted by disqualifications this year. This unwanted "tradition" started in 2002, and at worst it brings changes for the podium order months after the event. Perhaps the pre-selection process of the juries could be more thorough and careful upon those competitions that have a tendency and history in disqualifications. After over a decade of Assembly events, the future of them has perhaps never appeared as bright and secured as now. The 12th Assembly event showed and proofed us that the demo-scene is alive and doing well. The steady amount of little changes and alterations done to the competitions have proven to be successful. The enlargening of the event's contents each year, with e.g. seminars and concerts, have attracted more people in participating. The event's popularity has never been a challenge for the organizers, but the growth of the event in some ways has perhaps reached the ceiling. One of the most important things is that the event itself and the competitions keep evolving and that the organizers can successfully continue to squeeze new ideas for the following years. I personally had a fun time at Assembly'2003 by meeting many people, participating in the competitions and experiencing the jury process with'in. I'd like to say thanks and send greetings to every people who came to talk with me and whom I had the pleasure of meeting. Some planns for Assembly'2004 have already taken place and I've even completed one competition entry. The most ambitious project(s) that I'm working on won't most likely be finished in 2004, but hopefully I will have enough time to contribute a song or two for the music competitions. As always, I'm also open for any suggestions and offers for teamwork or co-operative in order to accomplish something bigger, so if you're in the need of e.g. music for demos, animations or flash demos, you know how to reach me. See you all next year at Assembly 2004!